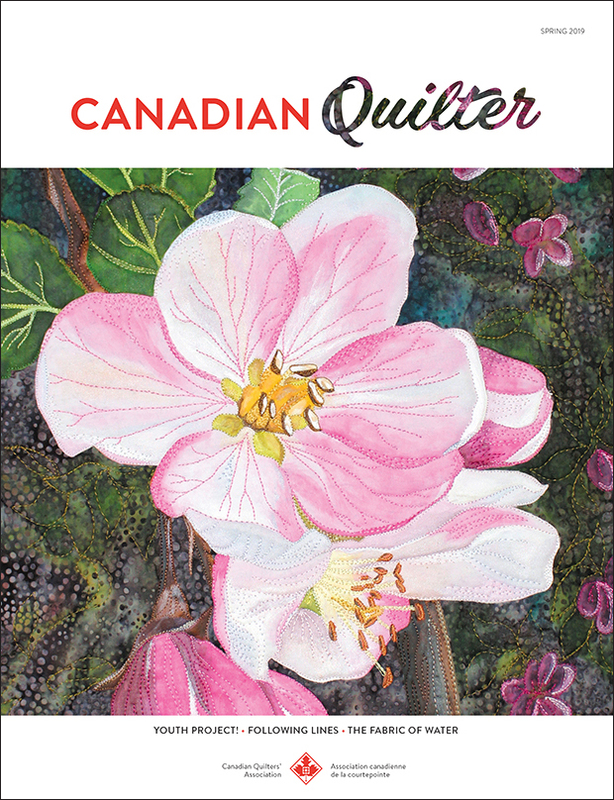 Melt those winter blues away with the exciting, spring issue of Canadian Quilter magazine! Quilt Canada 2019 teachers, Amanda McCavour and Tamara Kate, share some of their latest quilts and the inspiration behind their work. Learn about Pojagi and make a translucent wall hanging. Travel to Birmingham and view some incredible pieces from the prestigious Festival of Quilts! Enjoy making a lap quilt with the young quilters in your life—a fun, beachy pattern designed specifically for youth! Check out our new challenges – Member Guild Challenge and Suzi-Q Youth Challenge. Be inspired! Our feature pattern is an elegant, Poinsettia wreath wall hanging, Winter, designed by Arlene Nicholas of The Quilter’s Bouquet. Get a close-up view of the National Juried Show winning quilts. Travel to Spain with Elaine Quehl as she promotes Canadian quilting around the world. Try your hand at Big Stitch quilting on a colourful, little project. Canadian Quilter Facelift! We have exciting news about Canadian Quilter magazine… our summer issue welcomes brighter colours and a fresh, easy-to-read format. Wonderful, new patterns are available… Diggin’ the Diamonds and Berries and Blossoms. Explore vintage sewing machines and enjoy a close-up view of antique lace incorporated into unique, collector quilts. Get your copy today! The 2018 spring issue of Canadian Quilter is overflowing with inspiration. Journey to Australia to view some of Gloria Loughman’s colourful quilts—learn about Gloria’s creative process and how she balances work and play. Meet a Young Swirl—Kathleen Riggins—and see her energizing quilts! Try your hand at making a Modern quilted postcard. Visit with Jill Buckley to see an astounding collection of miniature toy sewing machines. View articles on handwork and more! Snuggle in your favourite chair and Keep Warm while reading the 2017 winter issue of Canadian Quilter magazine! There are loads of articles and projects to keep you busy during the cold season ahead. • Sneak preview of workshops and lectures at Quilt Canada 2018 in Vancouver, BC. • Read about one of Canada’s favourite quilt designers: Stacey Day. She’s a teacher and lecturer at Quilt Canada 2018! • Participate in the CQA/ACC Postcard Challenge fundraiser for BC Children’s Hospital—so easy and fun! • Pattern Pages offer projects to make friends and family for Christmas. • First-time pattern for young quilters—strip-pieced Christmas stocking! Share the magazine with your young quilter and teach them how to quilt! After summer winds down, quilters embrace autumn. Time to head back to quilt guild meetings and sewing days, to spend more time indoors with stashes and machines and to re-connect with fellow quilters after the summer months of sunshine, garden and family commitments: time to retreat. Have fun exploring retreat projects and articles in this issue! Also highlighted are all the winning quilts from the 2017 National Juried Show! With such a momentous year underway, the summer issue of Canadian Quilter is focused on all things Canadian. There are loads of projects for quilters: make an art quilt of the Parliament Building, whip up a festive set of placemats for your Canada Day celebrations or make your own Hexie necklace to wear with pride! We included photographs of fascinating quilts from Canadas’ history and we have a special feature written about Laurie Swim’s quilt-in-progress, which commemorates the Halifax Explosion of 1917. Enjoy celebrating Canada’s birthday with CQA/ACC and the Canadian Quilter! The theme of this issue, “Do you Guild?” features a selection of articles submitted by member guilds including a special guild project! In addition, learn all about one of Quilt Canada’s amazing teachers, Sue Patten, and catch the latest Quilt Canada news… eleven quilt shows under one roof! Back Issue: This issue is sold out. Help CQA/ACC make 1,000 quilts for Ronald McDonald House® locations across Canada! Learn how to participate in the Big Quilt Bee in the winter issue of Canadian Quilter. Take part in the CQA/ACC Trend-Tex® Challenge. Stitching a Canadian Memory is the theme… share your Canadian memories with quilters across Canada! Join our very own Liz Thompson on page 36… walk through Liz’s simple directions and make your quilting buddy a Mug Rug! Read advice from longarm quilters in the Canadian quilting industry and learn how to find and hire a longarm quilter to finish your quilts. Garner tips and tricks about how to start your own quilting business! Sponsor a Canadian youth to enter the Cantik Batiks® Youth Challenge. Support the Next Generation of quilters! “Mom’s Who Quilt” is the theme of our Autumn 2016 issue with all kinds of projects and ideas to inspire Moms (and Grand-Moms!). There are also over 30 pages of Quilt Canada 2016 details with award-winning quilt photographs and behind-the-scene stories. The summer issue of Canadian Quilter arrives in mailboxes across Canada in May—the height of quilt show season. Guild members will be adding finishing stitches to bindings and hanging sleeves to make quilts ready to display. Although the main purpose of guild shows is to exhibit quilts, there are an abundance of other activities designed to entice attendees to meet with friends and stay for the day: tearooms, vendor shops, raffle draws, demos and member boutiques. This issue is full of projects and ideas designed for guild quilt shows. Enjoy! Have a look at our play-themed issue for spring 2016! Part of connecting with people and learning about each other, is playing together. The joking, the teasing and the shared laughter help build community. Even though hard work is often involved, play makes fast friends. In quilting, play is also a wonderful way to explore new techniques or gain skills. In this issue we have projects that encourage play. Bring back your inner child (and crayons) to colour a quilted dragonfly….directions start on page 58. Read Beth Cameron’s reviews about new quilt books that offer opportunities to play on page 81. Learn about all the places to play at Quilt Canada 2016 on page eight. The theme of this issue of The Canadian Quilter is all about modern. Many of our regular column-writers focus on modern this issue. Read about the latest modern quilting books reviewed by Beth Cameron on page 17. Learn tips about thread on page 38. Discover contemporary designs in machine-quilting on page 45. Read about the slow method of modern quilting shared by Daintry Chitaroni on page 82. There are special modern projects in this issue as well! Try your hand at making a bright hexie pillow for a loved one or friend. If you’re a busy, on-the-move kind of quilter, you’ll love the fanny pack project! Make one up and carry your thimble, needles and other goodies with you everywhere you go. Speaking of modern projects—learn a new computer program with Lauren MacDonald and design your own quilting patterns—she makes it easy and fun. Quilt Canada 2016 is getting closer! Read about everything new at the conference next June held in Toronto. The article can be found on page 8. Learn more about the excellent instructors—Jane Sassaman on page 14 and Anna Hergert on page 18. Join in the fun and excitement of being a Canadian quilter—travel to Quilt Canada! Check out the story behind the magazine cover along with other photos from the 2015 Canadian Quilters’ Association Lethbridge Quilt Show. Many interesting articles, interviews and patterns available in this issue! The Autumn 2014 issue of The Canadian Quilter is filled with photos from Quilt Canada 2014: Wonders of Niagara (Members received with their magazine a separate booklet – the catalogue of the National Juried Show 2014 so that they could read all the quilters’ statements and view all the quilts in the show). The theme of this issue is ‘Tell Your Story’ so you will read stories by Carmen Portelli, Barb Spence, Sharon Bourque, Pauline Grondin, Daintry Chitaroni, Beth Cameron, Catherine Henderson, Deborah Sears and Rita Wasney. Many aspects of Quilt Canada 2014 are included. You can relive your visit to St. Catharines by reading about the shows, the Annual General Meeting, the awards and the Trend-Tex Challenge report. Many CQA/ACC members will relate to Hennie Aikman’s feelings about looking forward to Quilt Canada and planning for it annually! Other authors who wrote about Quilt Canada include Laine Canivet, Marcy Horswill, Jackie White, Nina Stahlschmidt and Susan Bowslaugh. No sooner than one Quilt Canada has finished, but we all begin to hear about the work behind the scenes in planning Quilt Canada 2015 to be held in Lethbridge, AB. Linda Schmidt, Vice President, introduces the Blowing in the Wind Trend-Tex Challenge for 2015. The Local Organizing Committee for the conference gives a description about the locale, the teachers and their workshops. And Marilyn Michelin, Director at Large, explains ‘Lollygagging to Lethbridge’ – the guild challenge for this year. For quilters planning their National Juried Show entry for 2015, the article by winner Deanna Gaudaur will be very interesting. Without giving you descriptions of every article in this magazine, suffice it to say that this issue will engross you with a pattern ‘Lest We Forget’ by Corinne Hewitt (missing pattern pieces can be found in the Members Only section of this website) and articles by Judy Weiss, Cindy Scraba, Daphne Greig, Anna Hergert, Kathy Bissett, Lauren MacDonald, Jo Ferguson, Brandy Lynn Maslowski, Ada Moyles, Karen Killins-Robinson, Linda Schmidt, Marilyn Michelin, Shirley Scharfe and Corinne Hewitt. This Summer 2014 issue is ‘dense’ with news, articles, photos and patterns. We interview Canadian designers Sherri Hisey and Cynthia Frenette and show a ‘scrapture’ technique by Frances H. Emery. More creative spaces (Marsha Cochrane and Catherine Cherrier) are described with photos. Computer related articles discuss Electric Quilt, our website www.canadianquilter.com and social media. We read about a quilt retreat that was snowbound during the winter. Another article highlights award-winning Quebec quilters. Reading the guild reports from many Canadian guilds is always informative (and amazing if you see that one guild donated 331 quilts to charity!). We meet the magazine’s new editor, Marcy Horswill, in this issue. We also bid farewell to Jill Buckley as our Artist in Residence, as she gives us some guidance in documenting our creative process. Following the theme ‘In Celebration of’, there are articles from both guilds and individual members. The Autumn challenge winners’ quilts are displayed. We also include an article about working with young quilters. You will find the photos and descriptions of the faculty for Quilt Canada 2014 in this issue. We feature a pattern by Rosemary Makhan, an accomplished Canadian applique artist and quilter who has since passed away. Let`s look at this issue. A number of coincidences happened this time. First of all, the Canadian designers featured have become personal favourites of mine as I worked with more than 1,000 quilters to do a mystery quilt which they recently featured online. Yet another chance happening, two regular contributors chose to share how to make cards – both with new twists on old ideas. I believe that you will enjoy their efforts. Just after the flood waters hit Southern Alberta many people started making quilts and we have three different articles about those efforts in different parts of the country. And there are lots more articles for you to enjoy between the covers. This time we feature lots of pictures and information about the events of Quilt BC 2013. When we see all the happenings it’s not difficult to imagine that Penticton was privileged to have such magnificent works on display and such fun activities in which to partake. Please enjoy reading about the quilt on the cover, which won Viewer’s choice at the National Juried Show. Also look over the creative uses of fabric in the CQA/ACC Trend-Tex Challenge. The Trend-Tex Fabrics ad on the inside back cover will give you a glimpse of what is in store for 2014! The Canadian Quilters’ Association honoured two special quilters, our Dorothy McMurdie and Teacher of the Year award winners, and we have that story for you, too. Also, being introduced this time are two new members to the Board of Directors. My curiosity was piqued as I read Daphne’s gizmos and widgets; like myself, you may not be familiar with this technology. But once piqued, our curiosity cannot be contained and I am so pleased that she chose this topic. We feature all kinds of quilts; the Grand National show was spectacular, once again. The guilds are producing wonderful creations and we had terrific results to challenges. Speaking of challenges, some of our Directors have been busy finalizing results of past challenges and creating new challenges for you. In this issue we cover the topic of teaching with a few excellent articles, each different in its own way. We have placed some emphasis on our member quilt shops; please visit them regularly. Modern quilting is being covered extensively as a new movement which we want to include along with our traditional outlook. Niagara is a vibrant quilting community which we tell you about and hope that you will visit in 2014. We present a couple of ideas for creating your own fabrics. We tell you how to make fabrics to dye for and in another article how to achieve ice dyed fabrics. Creative ideas are shared by our featured Canadian designer and our resident artist, Jill. The judge’s corner shows us the various types of machine quilting and there are lots of program ideas to be found in the regional reports. As there are additional interesting stories, be sure to turn every page. And challenges – we have a few to mention. The Youth Challenge has ended and we show three winners. We also show The Where Do You Read…challenge winners and offer a new, very creative challenge Through the Eyes of a Bug. Featured Article: What is Modern Quilting? Let’s look at the theme of this issue – quilting groups. I daresay the best feature of belonging to a quilting group is the support received from the group. They accept you and your work and give you the creative support which allows you to grow, expressively. Many groups provide much more, though, and it is the additional support we get from the group which cannot be rivalled. In this issue we have several articles related to our quilting groups theme. We have the results of the Pincushion Challenge—when we speak of creative, these are an excellent example. I, personally, was thrilled with the results. We’ve lots of good information for you this time. Note the couching project by the Langley Group and the instructions on how to make Alzheimers quilts. Daphne provides us with the latest in quilting gadgetry and Daintry discusses some pros and cons of having judged shows. Our creative quilters, Jill and the featured designer, give us a new pattern and new ideas to try. And we learn about Facebook and Virtual Quilting Groups, as well, as young quilters, quilters who have joined our regional representatives group, and quilters who have been honoured.